HINT: You may not be given density, but be resourceful. If you have the mass and volume of the gas instead, use the density equation and you’re in business! NOTE: Also note that since this a variation of the Ideal Gas Law, you will still be using “R,” which means that all units must be SI! 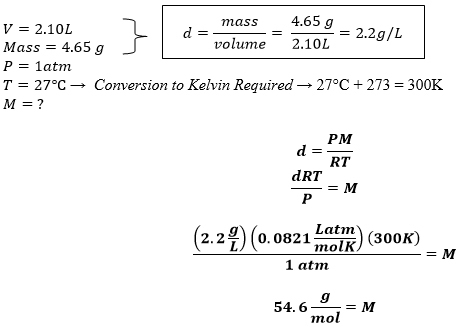 Problem: A 2.10-L vessel contains 4.65 g of a gas at 1.00 atm and 27.0°C. What is the molar mass of the gas?